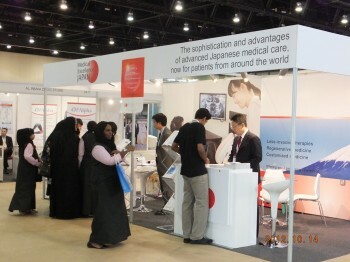 Med in Japan, as a member of Medical Excellence JAPAN (MEJ), in collaboration with Ministry of Economy, Trade, and Industry, launched the booth at the Abu Dhabi Medical Congress 2012 during 14-16 October 2012. Its objective was to strengthen the cooperation of medical care in Japan and United Arab Emirates. At the congress, many participants from Arab region visited and discussed with staffs of Med in Japan at the booth. This also included CEO of the HAAD (the Health Authority – Abu Dhabi) who showed interest in Japanese advanced healthcare system. Med in Japan also aimed to be the tie for bilateral medical exchanges between two countries.